There is a temptation to think that this is a one-of-a-kind pass. After all, where else in the world can you find a moderate climb over a named pass through the glitzy urban environment of the Cote d'Azur. The answer is: on the Cote d'Azur. Actually several points on the Grande Corniche and Moyenne Corniche are named passes. 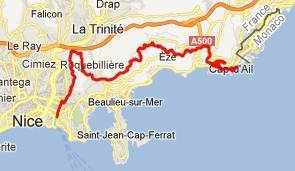 The Col d'Eze is just the best knows of these, and also the highest point on the Grande Corniche between Nice and Monaco. The pass can also serve as shoulder point to countless higher climbs. From East. Given the maze of roads in this area, there are practically close to infinitely many ways to approach this point from the Nice area. But the most straight forward way is to follow signs for Menton and Monaco in Nice, that lead to the Grande Corniche. A fairly wide road leads to the Col de Quatre Chemins. The steepest uphill option from there continues to the Col d'Eze. From the Col de Quatre Chemins there also an unpaved path, that forks off the Chemin strategique (approach to the col de Quatre Chemin). This path is bordered by a low wall, giving it the feel of a long balcony. It goes around the other side of the "Plateau de Justice" than the paved road does. While the paved route looks out over the sea, the unpaved path has panoramic views of the mountains, as well as the housing projects of of La Condamine below. Even on a Saturday morning in May I was the only person using this path. The Cote d'Azur does not have to be crowded, just the immediate coast. The paved road on the other hand soon climbs out of the the forest and gives a constant view of the sea and the bay Eze-bord-de-Mer with its yachts and castle like estates. The pass is between two rounded hills, Papates to the north and Mont Bastide on the sea side. Immediately before reaching the pass, a short foot trail branches to the south, to the top of Mount Bastide. It provides views similar to those, that can be had from the road, except for one major difference during late April/ early May: The vistas of the shore are foregrounded by a riot of colorful wild flowers. A few pictures from the footpath are included in the picture page. Col d'Eze is located at the junction D46-D2564. D2546 climbs above the pass. It is still possible to follow D2546 through La Turbie and descend from there. That options reaches a point that is just a few feet higher. Alternatively one can climb to higher passes including Col de Guerre, Col de la Madone and many others. From West. (described downwards). To make the Col d'Eze the highest point on the profile, you have to stay right and change to D46. In spite of the 500 meters of elevation, you are only 1.7km from the sea as the crow flies. So far I have not cycled this approach. The temptation to keep on climbing from here has always been to great. But I have heard glowing descriptions of the views of Monaco from this approach. The profiled approach descends into Cap d'Ail, still west of Monaco. Col d'Eze: 177 bd observotoire, Nice > col de Quatre Chemins(shp) > unpaved route to col d'Eze > col de Quatre Chemins(shp) > down chemin de Vingrainette(?) > Nice > roll around Nice > sp: 18.8miles with 1870ft of climbing in 2:21 hours (VDO MC1.0 m4.12.5.12). Notes: After the small excursion to the col d'Eze the day was devoted of finding supplies in Nice and lugging them back to 177 bd observoitoire.